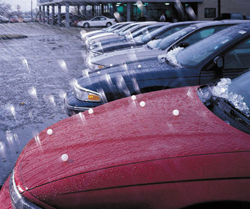 At Dave’s Auto Body Co. we provide quality, affordable hail damage repair. If you experience hail or storm damage, please first contact your insurance carrier and start the claim process before contacting the body shop. Some insurance carriers set up CAT or Catastrophe claim centers to first inspect damaged vehicles. If your carrier has set up a CAT site we are required to start repairs based off of their initial estimate. If your carrier requires you to have the shop first inspect the vehicle, contact us to schedule an appointment. If you have any questions regarding how to process your claim please call or email us, we will be happy to assist you.